This photograph was taken outside Captain’s house in Fishersgate at Easter 1955. 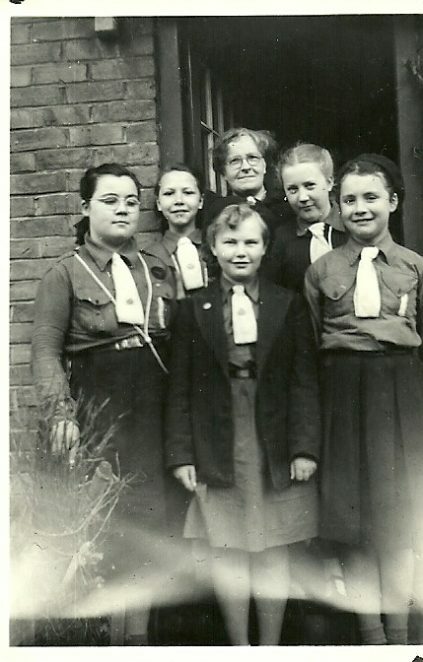 From the left are: Teresa Gillon, Mary Byrne,Captain(Miss Brookes),Teresa Scott,Mary Gillon.Front centre is Kathleen Read. I remember all of the girls in this picture. Teresa and Mary Gillon were classmates at various times and so was Teresa Scott. Mary Byrne was not only in my class but sat next to me for a whole term. Kathleen Read was particularly memorable for her long blond ringlets which she appears to be hiding in this picture. I think I might have had the long blonde ringlets cut off by this time! Well I never! I was in the 11th Brighton (St Joseph’s) Brownies and remember Miss Brookes as our Brown Owl/Captain. That would be approx 1967/1969. Miss Brookes travelled from her home in Fishersgate to Milton Road Hall (opposite St Joseph’s Church) every week, on the bus! She was a remarkable woman. The other brownies I remember from that time are Judith Appleby, Maureen Johnson, Rose Canning and Katherine Cikalo? I was a Leprechaun – never quite made it as a Sixer, was always a Seconder! I also remember the annual Brownie Revels that happened at the old RC convent in Rottingdean. One year,we did a short display of our interpretation of The Wizard of Oz! I was a munchkin, and I remember standing in the wet and cold of a typical summer’s day! I have some old photos which I must locate and post on this sight! Also remember going on the cooking hike to the woodland along the London Road, beyond Patcham. Loved cooking sausages on our home made fire! Boggarts out Brownies in now we’ll have our pow wow ring! Sure that was our saying! Remember the old red topped toadstool?